Reliable Taxi Booking App for passengers for booking taxi on any occasion to obtain the service of nearby drivers. The app requires registration of users and one time payment authentication using credit card/ paypal is processed for future payments. This allows convenient usage of app for requesting rides anytime since automated fare estimation & payment facility is included. Once the rider locate themselves on the map and set the destination, they can request for the ride and any nearby driver will pickup the passenger. 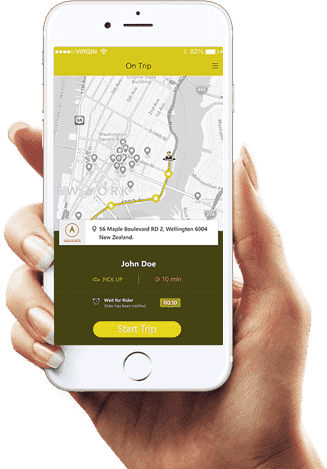 After completing the trip, passengers can rate the driver and provide review about the travel experience in passenger app. Passenger app is available in both iOS and Android. Free simple passenger registration steps. Passenger can set up individual profile. One time payment authentication using credit card / PayPal. Automatic detection of taxi in the nearby area using GPS. Passenger can see the estimated time for the pickup. Push notification facility once the driver reaches the pickup point. Rate the driver after successful ride. Trip history with map view. Help facility for any kind of customer assistance.